In the beginning, there was the flame and there was the pot. Even today, though we’ve invented many variations on the themes of flame and pot, there are still few other ways to apply heat to cook raw foodstuffs. The deep satisfaction of the grill is something felt at every backyard barbecue, something we all know and most love. The place to go to tap into ancient memories of a cauldron-side supper, at least in San Diego, isLittle Sheep Mongolian Hot Pot (4718 Clairemont Mesa Blvd. in Clairemont). 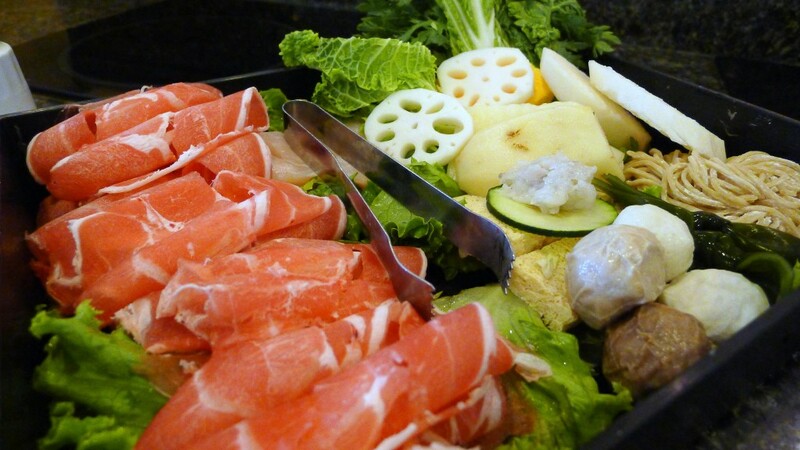 Little Sheep is built around Mongolian hot pot (sometimes called “Chinese hot pot,” “steamboat,” “firepot” or “Chinese fondue”), a dish that’s similar to Japanese shabu shabu andnabemono dishes, Korean sinseollo and European meat fondue. What they share, of course, is the essential feature of meat and other ingredients dipped and cooked at the table in a tasty, roiling liquid. What they also share is a communal feel, with diners sharing that pot of cooking liquid. The food at Little Sheep derives from the nomadic Mongol warrior tradition of strips of meat skewered on spears and cooked in a communal pot. This evolved into a firepot made of thin beaten metal with a funnel in the middle, heating the liquid around the funnel both from within and below such that strips of meat cook in seconds. Little Sheep goes a step further with a simple soup pot over an electric-burner setup. It all begins with the broth, the choices being a “house original,” spicy “mala” and mushroom-vegetarian versions. The Sichuanese mala is laced with dried chiles, Sichuan peppercorns and a deep cumin growl. The original offers onion and garlic roundness, a richness born of long-simmered beef, chicken and pork bones and sweet spices. My favorite approach is a “yin yang” pot with one half mala, the other original. The broths are something of a Little Sheep innovation. Chinese hot pot usually offers less-flavorful broths with more flavor coming from dipping sauces. There’s no wrong way to eat Mongolian hot pot. Some follow a traditional procession: meats, then seafood, then soy products (tofu and bean curd), before finishing with noodles, veggies and dumplings, each cooked sequentially, a few at a time. Others choose more iconoclastic approaches—some dumping all at once, others picking and choosing according to whim. It’s all good. The red meats at Little Sheep are excellent: ruby and marbled. The lamb is particularly good. One of the best parts of the meal is when the vegetables, soy products and noodlesóparticularly the daikon, bean curd and udon—take on the deep flavors of the broths. It’s an excellent conclusion to a wonderful meal that just begs to be shared with family and friends. Hot pot is not fast food, though the foodstuffs cook in moments. It’s slow food that harks back to a different time and place, when the evening meal was the sustenance, yes, but entertainment and community, too. At Little Sheep, it can be again.